Robin and Sachiko visited the lab of Dr. van der Meer at UNIL on the 23rd of Jan. After meeting in the office and learning how the basic principles work, we went on a tour of the lab, saw his student’s work with microfluidics, discussed the possibility of the students working in his lab for handling arsenic standards. The other purpose and timing of going to the laboratory then was to obtain a stab culture of the arsenic GFP reporter bacteria, so we could send it to the (art)ScienceBLR collaborators in time for the hackterialab 2013 Bangalore. The bacteria was shipped, and it arrived a day before Sachiko did at the NCBS in Prof. Mukund Thattai‘s lab. Here it is! 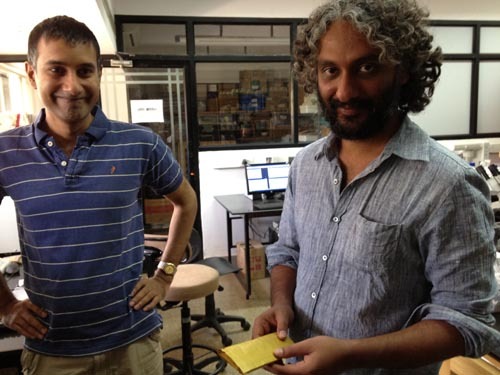 Then Sachiko arrived at hackterialab 2013 Bangalore. During the introductions, I mentioned working between the boundaries – and one that is a big experiment, is that of the academic institution and open culture. The arsenic GFP bioreporter is described in this manuscript: Stocker, J., D. Balluch, et al. (2003). Environ. Sci. Technol. 37: 4743-4750. Thus it is in the public domain. NCBS is a research institution, and they received the material, and now it is registered as such… How will this evolve?